Pronunciation changes with context, and every rule has exceptions. Note that each consonant is itself a word, pronounced by name when that word is spoken. There are other words read, not alphabetically, but according to a syllabaric scheme that preceded the alphabetic innovations. Despite many exceptions, alphabetic reading prevails. Stress. Words of two or more syllables usually stress the next to last syllable. A few stress the last syllable, indicated in writing by a doubled final consonant. The following guide supplies character names and alphabetic readings. The information comes from Dvarsh Workbook. 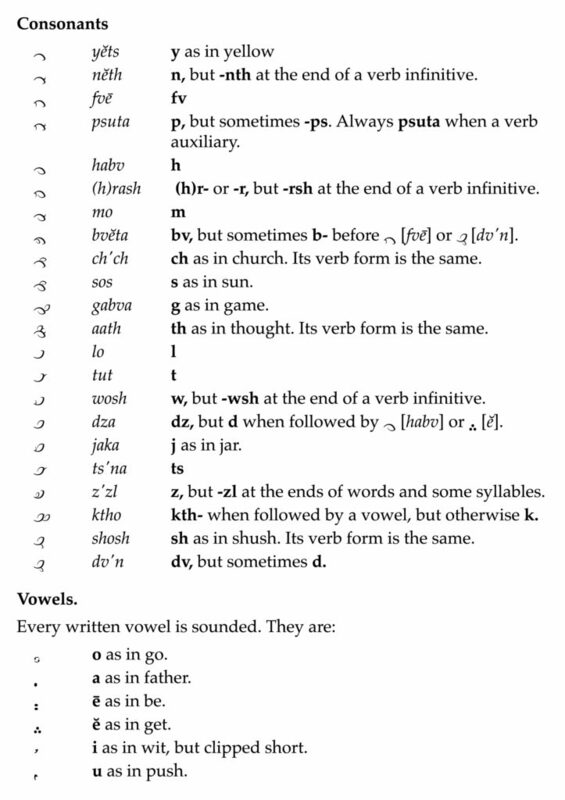 For a fuller treatment of rules and conventions governing pronunciation, please see Dvarsh, An Introduction.